The Ada High School Couganns dance team take the field in this previously unpublished October 29, 1988 image. Everyone in this picture is in her 40s now. October 24, 2013, today, marks 25 years for me at The Ada News. Much had changed here in my corner of photojournalism, and much has remained the same. That also applies to my personal life. My personal life is too complex to summarize with bullet points, so I will say this: I once was lost, but now am found. I’ve spent nine of my 25 years in “Greater Ader” very happily married to Abby. 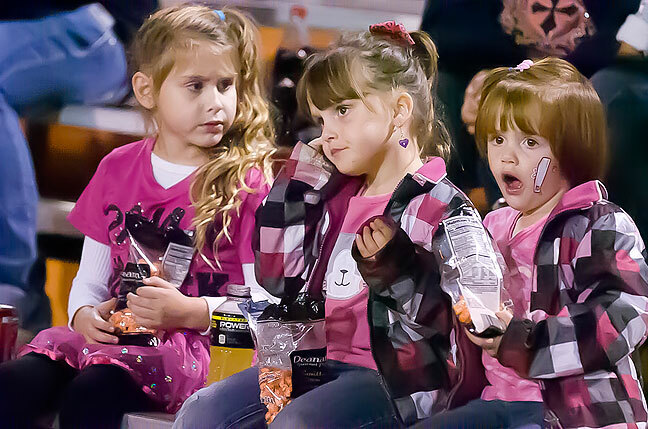 In one of my most recently published images, Dusty Westmoreland, Piper Kirkwood and Paylyn Kirkwood take a snack break at the Konawa vs Tishomingo football game in Konawa Thursday night, Oct. 17, 2013. That’s one of my favorite things about photography — that it freezes time and instants, so that looking at old photos is something like traveling in a time machine.